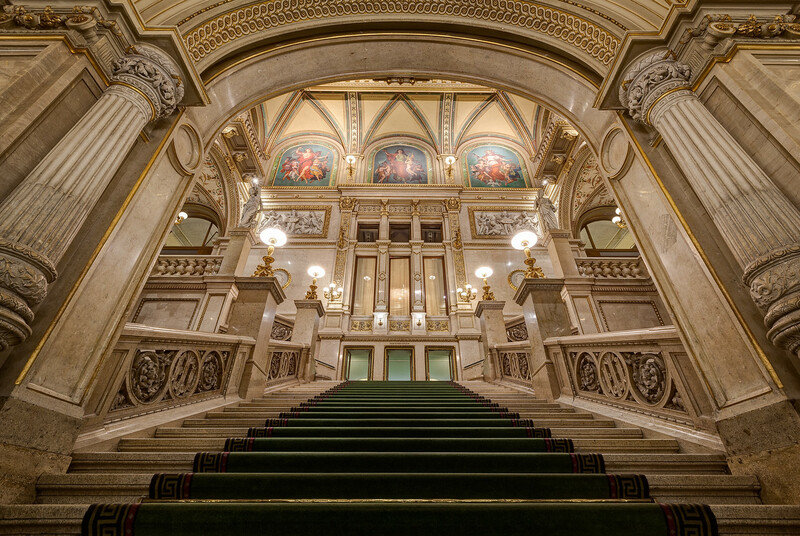 The amazing country of Austria. I have been REALLY lucky just to travel and see some of the amazing things I have so far in my life. I am sometimes flabbergasted at my luck when it comes to the kindness of others. I often find if you ask nicely, people are happy to help and interested in what you are trying to do. 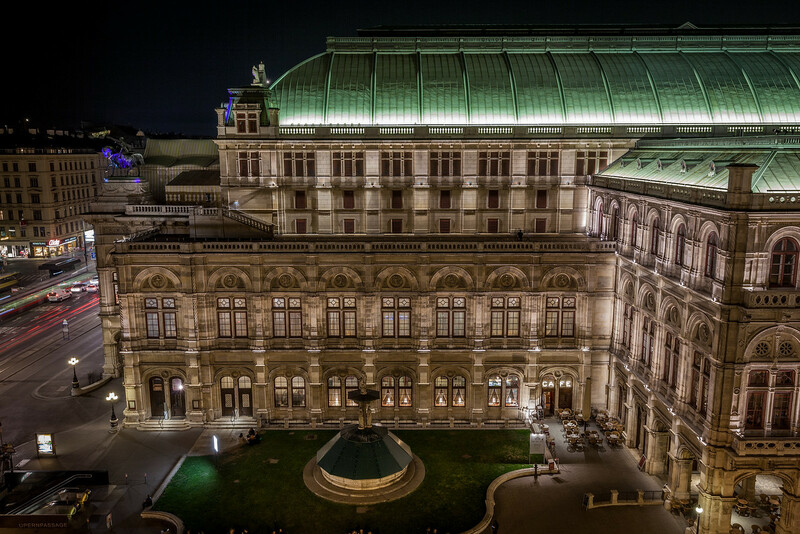 Take Austria…I was only there for one night, and I simply asked if the hotel might have a room I could stay in with a great view of the Opera House. They put me in a suite with a view that was…well it wasn’t at all shabby! BEHOLD! She is Singing to Bring Down the Chandelier! On Monday I said I was working on something a bit more colorful from my stop in Vienna, Austria and I hope this doesn’t disappoint. 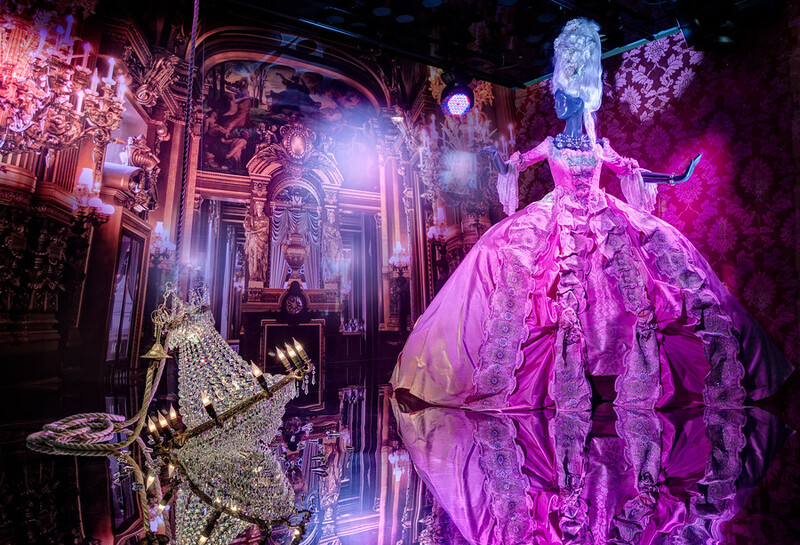 When I saw the color in the window of the Swarovski shop, I was working out a photo immediately…and that was before it occurred to me WHAT was going on in this wonderful window display! We are told, Ladies and Gentlemen, this IS the very Chandelier which figures in the famous….disaster! Seriously, one of my favorite broadway hits of all time is Phantom of the Opera. I haven’t seen it as many times as Cats (don’t ask), but it has remained tops all these years for me. Oddly I keep referring to the mannequin as Carlotta, but everyone knows Carlotta was stricken by a mysterious bout of laryngitis and Christine had taken over the principal role in Il Muto during the fall of the Chandelier! 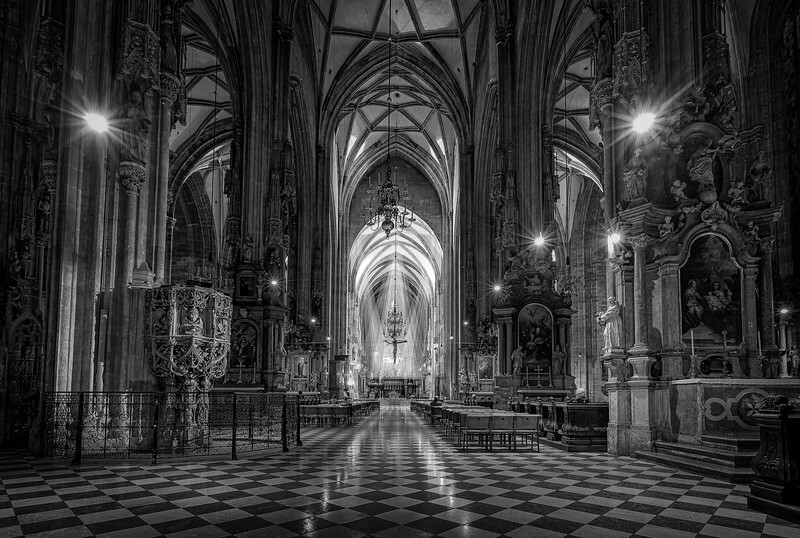 It’s funny…all of the photos of my overnight stay in Vienna are in black and white! I never intend it and I am purposefully working on a very colorful and fun photo for Thursday to show a different side of the city. 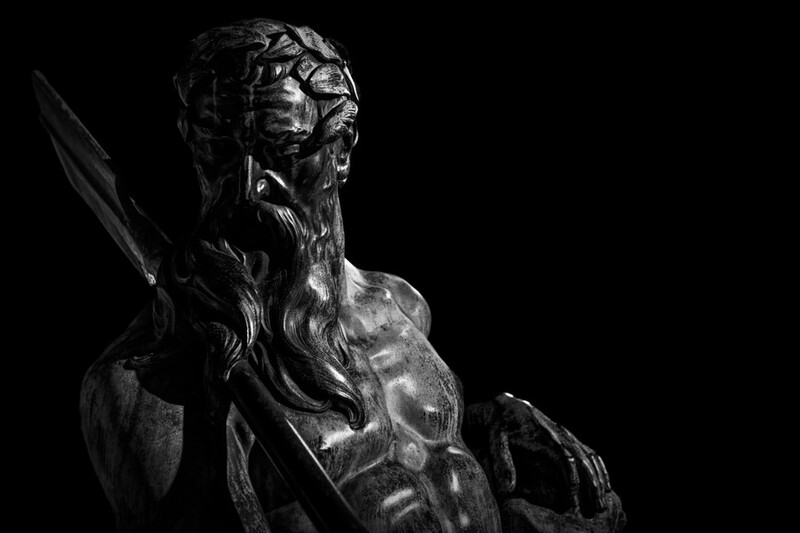 This photo Poseidon on the streets of Vienna, however, HAD to be noir. 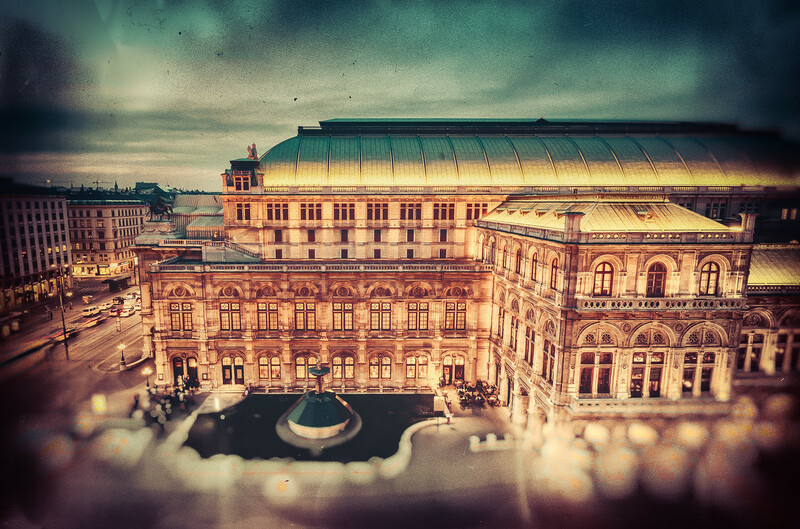 Vienna and night, black and white, it all seems to flow perfectly in my mind. Traveling all over the world, you have to be alert! Some people are up to no good. Fortunately I have only had two odd experiences that didn’t escalate into something more serious. One was in Buenos Aires, the other was in Vienna. The only time someone has tried to pick my pocket was in the heart of Vienna! Luckily she was a TERRIBLE pick. Her first attempt was an announcement she was interested in my wallet (which was in my front pocket) and not the back pocket she tried to retrieve it from. The big problem, was she must have decided I was worth the trouble because she kept following me. I was never in any danger in the crowded tourist streets, so I sat down on a bench. She likewise sat down across the street and started begging for money, and watching me out of the corner of her eye. I stared straight back at her! She finally realized I was on to her and let me be. Anytime you travel, you need to be prepared. This particular situation for more comical/sad than anything, but you never know when things might get more serious. I recommend a great book called The Gift of Fear. The world in general is pretty safe, but always listen to your gut and stay safe! It’s no secret I love Noir. Literally meaning black in French, the term Film Noir has been used to describe mostly crime drama’s and have had a number of notable hits including one of my favorite Orson Wells films, The Third Man. 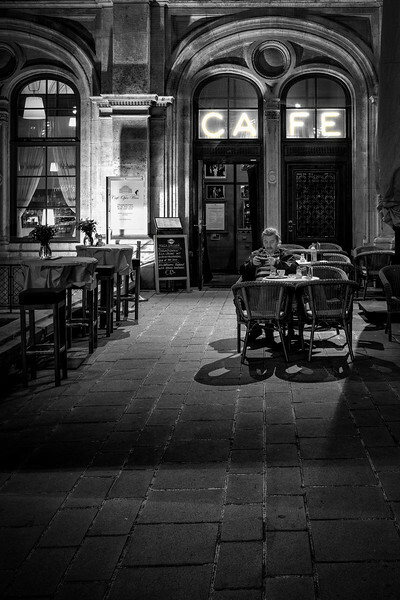 I couldn’t help but conjure up gritty black and white fantasies as I wandered the streets of Vienna. My only regret was that the streets weren’t a glistening with a never seen rain. Somehow that would have made the night perfect…along with the running of hard soled shoes across the inky wet desolate cobblestone streets as I was chased into the sewers…but I digress. This is one of the many lessons of my rapid travel. Time, these days, is so very precious to me. Sometimes I feel it is best spent sitting and observing. Other times it slips away as if driven by a locomotive and I can’t find the photo. I came all this way and I can’t find the damned photo! What am I doing? I often look around and wonder when it has gone, but during my trips, it can seems in three days I have been gone an eternity. What was life like before the road? When I return, I wonder how it was I was just in (say) Europe…yesterday. Was it even real? It seems like I never left. There seems to be an uneven application of time, the meter of which exists only in our own perception. During my short time in Vienna, Auatria I visited St Stephen’s Cathedral (Stephansdom). Here I didn’t have enough time, but I think I came away with a decent shot.